Stupid owning two pairs of gloves? Everyone should have several pairs of gloves. 2 pairs isn’t enough. Same goes for goggles. When I used to play racquetball I had probably 10 gloves. Great to have extras. Mud run? LOTS of gloves is a must have. Long hot sweaty days? At least two pairs. I also wash my stuff, including gloves. Washing actually extends the life of clothing and gear. That's reason enough to have at least two pairs. The question is, why would you think anyone would be against having two pairs? You a Russian bot hired by Bryan, generating posts? I do question white gloves. Why Why Why? I have white gloves, chicks dig them! I have 3 pairs. 2 100% and my favorites, a pair of red/white/black ANSRs. More is better...........but those Dirtpaws.....they seem fine until you try a really well made glove, like the Leatt GPX 3.5 X-Flow Glove............you never think about them, they do not fall apart, and they do not bunch up on your palm. I buy so much on closeout or at track day sales. You can't have too much riding gear. While you're on a 2 day camping trip and people put back on wet clothes, you put all dry new stuff on. Yep, chicks dig em. And I like them too (actually white with black highlights). They look cool in GoPro vids. If you think those gloves are white your issues are bigger than I thought. "white with black highlights", but yeah, black and white would be more accurate. Also 30 pairs of socks and underwear cus I don't have a washer/dryer at the place I rent and only like to go to the laundromat once month. Damn Filter, great minds think alike. I have all the same as you (a few more jerseys and pants), except about 90 pairs of socks. Yes, I admit I have a sock problem. Comes from growing up with 2-3 pairs of hand me down socks (from a distant cousin no less) and one pair of shoes. Just love buying a nice new pair of socks. Definitely nice to have two helmets and two sets of boots. I have summer and winter Gaernes. One size difference. Smaller size is for summer and very thin nylon-like socks. Larger size is winter with thick or double socks. But can swap out no matter what time of year. 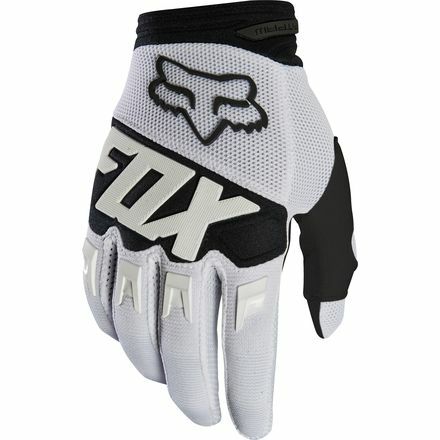 My favorite gloves are the Fox Dirtpaws. WHITE ONES, Piney Woods! They don't get hot and last forever. Fit my large hands perfectly. Never had a blister. 2 pairs at a minimum per track/ride day. Nothing worse then having mud on your gloves and then transferring that crust onto the controls. Dirtpaws = you never think about them, they do not fall apart, and they do not bunch up on your palm...for me. I ride 50+ times a year. My dirtpaws would be toast in 10 rides, and all stretched out. That is why I no longer use them. Five MXF and I recently found out they work to swipe my dedicated phone/GPS screen when I occasionally use it. Taken a few years to acquire all the gear but is great to be able to take off the soaking wet gear between rides when its 35C/95F in the summer OR when its monsooning rain in the PNW during the fall/winter/spring. Also hand wash my dedicates between monthly trips to the laundromat. Maybe a different batch? I bought a bunch in 2013 and 2015. None have worn out. I wear large, and they fit tight. I don't grip the bars very tightly. No blisters. No hand fatigue. Always have ridden this way. Maybe that is the difference? I do wash my gloves in the laundry and air dry. Started washing gear when I became a Navy diver. Makes it last much longer, as dirt acts as an abrasive. I will also swap out between rides if they get muddy.